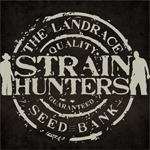 Strain Hunters is a series of documentaries aimed at informing the general public about the quest for the preservation of the cannabis plant in the form of particularly vulnerable landraces originating in the poorest areas of the planet. The sole intent of Strain Hunters is to identify, locate and retrieve cannabis landraces that have not yet been studied, in order to give scientists and doctors the possibility to further enhance knowledge of the cannabis plant in the medicinal field. Many previously unknown cannabinoid profiles are contained in cannabis landraces originating from areas where there is no possibility of scientific research. One day these plants could be helpful in developing better medications for the sick and the suffering. Strainhunters feel it is their duty to preserve as many cannabis landraces in their genetic database, and by breeding them into other well-studied medicinal strains for the sole purpose of scientific research.